It begins on February 3rd and lasts three days with traditional and folkloristic events. We are dealing with the Saint Agatha’s Feast (Festa di Sant’Agata), one of the most famous Christian fair in the world. That’s why more than 1 million people take part to the fair: not only christian votaries but also a lot of tourists who rent a Villa in Sicily with sea view to join it. 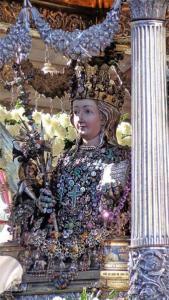 This huge event takes place in Catania, the biggest and important city of the East Sicily, as the Patroness’ Feast. Through passion, sorrow, fights and escapes, Saint Agatha’ story tells about a rich women who lived during the 3rd century. She is celebrated because she chose to die instead of renounce to her Christian devotion. In fact, in that century the emperor Decio decided to impose the pagan religion in the lands of his empire: it’s one of the historical Christian persecution. When she was trying to escape from Catania to avoid the persecution, she was founded and then forced to recant her religion but she didn’t, being tortured by pagans and at the end condemned to the stake. She died in Catania on February 5th 253 a.D.
For her sacrifice, Agatha became saint of the Christian Church and the patroness of many cities, even though the biggest feast for her is set every year in Catania. During these three days, the most important event is surely the procession. On February 3rd people who take part in the procession bring a particular candle: it has to be the same weight or the same height of the person who brings it, as to repeat simbolically Saint Agatha’s sacrifice. The day after is probably the most touching day of the feast: people walk around the city centre wearing white tunics, black gloves and shaking a white cloth. Saint Agatha’s votaries want to perform the historical event when, in 1126, two soldiers brought back to Catania the saint’s relics from Constantinople, stolen a century before. During the last day, after the holy mass in the Cathedral, and the sunset the second part of the procession starts: it takes place in Catania’s old centre and lasts until the sunrise of the day after. Every year, despite weariness and suffering, Saint Agatha’s votaries are happy and satisfied, waiting for the next year’s celebrations. This feast is, of course, full of traditional and sicilian folkloristic events. It’s one of the best way to discover the wonderful city of Catania.